USF anthropologist Erin Kimmerle shows slides from her team's investigation of the Dozier Reform School for Boys at Thursday's Florida cabinet meeting. WUSF's Mark Schreiner talks about the final investigative report that USF researchers presented to the Florida cabinet Thursday. University of South Florida researchers presented their final report on the Robert G. Dozier School for Boys to the state cabinet Thursday, and even though this closes one chapter in a lengthy saga, a number of loose ends remain. Using DNA samples from the remains and from family members, the research team successfully identified seven of the 51 sets of remains exhumed from 55 unmarked graves in a cemetery at the Marianna reform school. They also have presumptive identifications of 14 more sets. 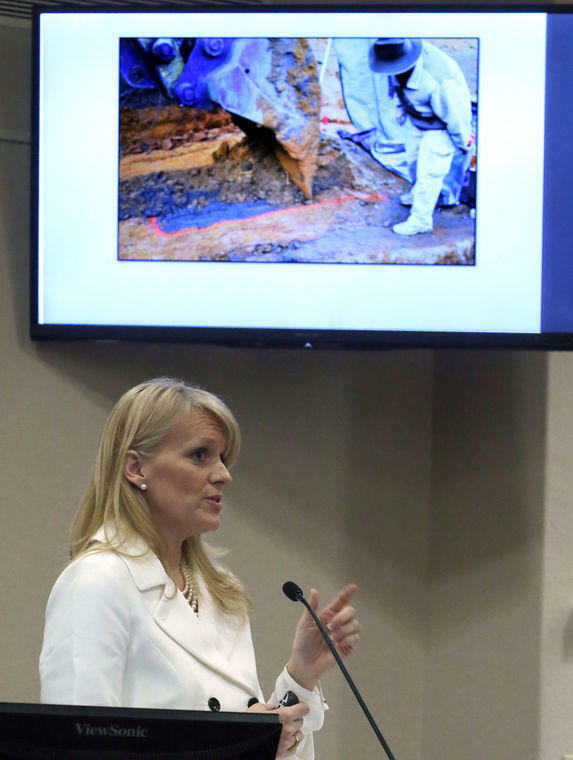 However, of the many questions their work answered, there's still an important one that lead anthropologist, Doctor Erin Kimmerle, faced Thursday from Attorney General Pam Bondi: could she say for sure that they found all the remains buried on Dozier's 1,400 acres? "That's not something we could ever do given the size and scope of what we're talking about," Kimmerle said. "We feel a very strong commitment to the families we have come to know through this process, and have worked with," Kimmerle told Bondi and other cabinet officials, including Gov. Rick Scott. "I can tell you they are very grateful that you took this chance and allowed this to happen." Often in cases of restorative justice or other truth-telling missions, it is imperative for victims and communities to establish the facts of what offenses occurred. Even in cases where law enforcement and prosecutors are unable to file criminal charges due to the statute of limitations or deaths of offenders, transparency and acknowledgement of the abuses are important components for reconciling conflict and restoring justice. In historical cases such as this, it is not always possible to find physical evidence of abuse. However, the collective testimonies from the same time period as past State Investigations in the early 1960s in which disciplinary action was taken against some of the staff, combined with the circumstantial findings in this investigation, lends to the credibility of the claims. It should be further stated that while we did not find physical evidence to substantiate such claims (though it was not our intent to do so), we did not find credible evidence to disprove or discredit the testimonies we did take. On the contrary, we found the testimonies used in our research to be honest and credible. Such testimonies as they relate to some of the death investigations have been summarized in this report. Some of those now-grown students, members of a group known as the White House Boys, urged lawmakers to not allow the unidentified remains to be returned to Dozier's graveyard. Robert Straley was among those calling for a more proper memorial to what happened at the school. "These boys' lives were not lost in vain, for their story changed the laws of juvenile justice in Florida and their monument should be a shining reminder that decades of darkness cannot hide all things," Straley said. "These kids were not taken care of in life, and we're afraid they are not going to be taken care of in death," said White House Boys vice president Bill Price. And Charles Fudge, a White House Boy who was sent to the school in 1960, said: "The property should never even be in consideration for sale, or anything other than finding the remaining graves and any bodies that are still buried there." Marianna officials would like to have the property, with some saying it would help start the healing process. "My first thing will to be say to anybody that those before my time did wrong," former Marianna mayor Elmore Bryant told the cabinet. "As Martin Luther King said, it's never too late to make wrong right. I want to do that." Tallahassee NAACP President Dale Landry suggested turning a church on the Dozier grounds into a mausoleum to hold the remains, either as a temporary home in case they're identified, or as a final resting place. In addition to a memorial, lawmakers have to consider what will be done with the school grounds and buildings, which have been vacant since the state closed Dozier in 2011. Florida Commissioner of Agriculture Adam Putnam said leaving the school as it currently is is not an option. "It would make it worse for it to turn into a caricature of itself, some haunted juvenile prison that just breeds more rumors and mythology and things as people drive by and see the kudzu take back over, I don't think that's what any of us want," Putnam said. One new issue disclosed Thursday could complicate the disposition of the property. USF anthropology professor Christian Wells said they discovered lead, arsenic, mercury and asbestos in some of the school grounds - a dangerous chemical cocktail possibly created by the methods and materials used to originally bury the boys. A pair of bills have been filed that would allow reimbursements to family members of deceased boys to help cover the costs of reinterring bodies. 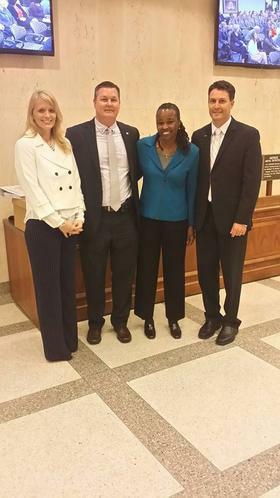 One bill, filed by Senate Minority Leader Arthenia Joyner, D-Tampa, would allow payments of up to $7,500 per family. A bill in the House filed by Rep. Ed Narain, D-Tampa, would allow payments of $5,000. Both call for setting aside $1.5 million in the 2016-2017 state budget to carry out the proposed bills. Cabinet officials also indicated that a coalition of state funeral homes may end up picking up the cost to reinter any remains for families that can't afford it. So far, four of the seven sets of remains that have been identified have been reburied. USF researchers will continue attempting to find DNA matches for the unidentified remains. They'll also talk about their work at a international conference to be held in Japan this summer. The case will be the subject of a documentary scheduled to be released later this year. Kimmerle said Thursday the documentary will focus on five families of Dozier victims. Kimmerle is also set to brief U.S. Senator Bill Nelson about the case on Friday. Nelson has called for a federal investigation of Dozier.